Arunachal Pradesh Congress Committee members hold ptotest against Citizenship Bill on January 24. Image:Northeast Now. Arunachal Pradesh Congress Committee on Thursday staged protest demonstrations and rallies in various places of the State against the Citizenship (Amendment) Bill, 2016. The contentious Bill that was passed in the Lok Sabha on January 8, is yet to get a Rajya Sabha nod. 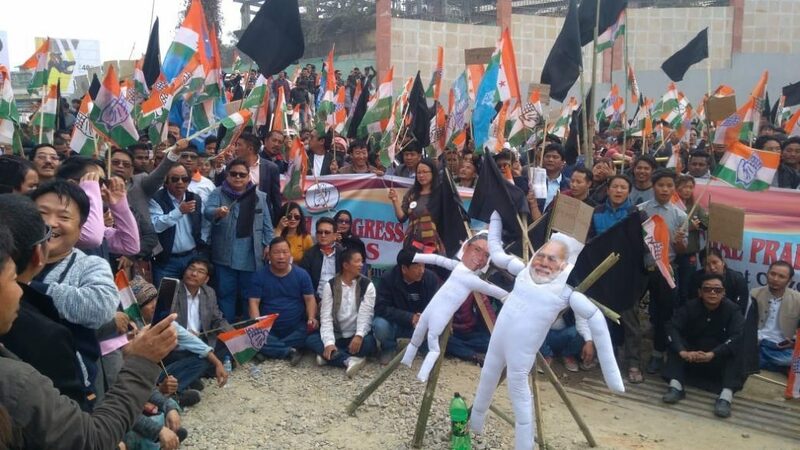 At the capital here, hundreds of Congress leaders and workers led by Arunachal Pradesh Congress Committee (APCC) president Takam Sanjoy staged a sit-in protest in front of the Civil Secretariat where they also burnt effigies of Prime Minister Narendra Modi and Chief Minister Pema Khandu. Addressing the gathering, Sanjoy said the Bill was unconstitutional, discriminatory and particularly against the indigenous people of the State and North East. “The Citizenship Amendment Bill will endanger the existence of indigenous people and create communal disharmony in the entire Northeast. We will never accept Bangladeshi refugees or that of any other country or community as Indian citizens and will continue to oppose the Bill,” Sanjay said. The Congress state chief also took a dig at Chief Minister Khandu for extending support to the ‘draconian bill’. Joining his Assam counterpart Sarbananda Sonowal in defending the Bill, Khandu, while addressing a gathering at Seijosa in Pakke Kessang district recently had said that “people with vested interests” have been misinterpreting the Bill to create confusion. “The chief minister alone cannot take a decision whether to accept the Bill or not, as it will have a direct impact on the people of State. We know that he (Khandu) is a little in-experienced when it comes to politics, however, when it is comes to taking such major decisions, he should be more careful and think a thousand times before making such statements,” Sanjoy said. Sanjoy said the British had enacted ‘Chini Hill Act’ in 1846 and ‘Bengal Easter Frontier Regulation’ in 1872 to protect the then North East Frontier Agency (NEFA). However, “Prime Minister Modi who claims to be the chowkidar of India is adamant to demolish the most sensitive state which shares its border with Myanmar, Bhutan and China”. Arunachal Pradesh was earlier known as North East Frontier Area (NEFA). The Congress leader further alleged that the BJP by introducing the Bill was trying to negate the Citizenship Act of 1955, the Assam Accord of 1985 and the latest judgment of Supreme Court on National Register of Citizens (NRC). The Bill introduced in the Lok Sabha on July 15, 2016, seeks to amend the Citizenship Act, 1955 to provide citizenship to persecuted migrants from minority communities from Afghanistan, Bangladesh and Pakistan, who are Hindus, Sikhs, Buddhists, Jains, Parsis or Christians.